In 2007, Tyler Atkinson approached the owner of a barbershop in downtown Lake Oswego's Country Square shopping center who had purchased it from the estate of a man who had run the business for more than 50 years. Atkinson didn't have the $10,000 that the seller was asking for, so he proposed paying $5,000 up front and another $5,000 over the course of the next year. But the seller raised the price to $15,000, and Atkinson was forced to shake hands and walk away. A year later, as he was barbering at the Multnomah Athletic Club, Atkinson saw an advertisement for a barbershop that was for sale in downtown Lake Oswego for $3,500. He bought it later that day, with help from his father-in-law. And for 11 years, Atkinson operated the Country Square Barber Shop on Lake Oswego's Second Street. Now, he and partner Jeramie Lund have taken the next step in their company's development. 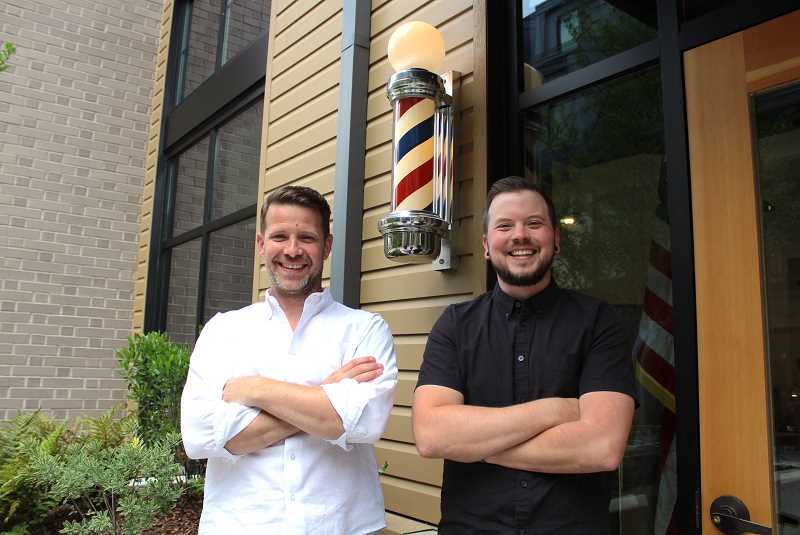 In June, Atkinson and Lund changed the name of the business to Richard Henry Barbershop and moved into The Windward (385 Second St., Lake Oswego), where a classic, rotating barber pole greets customers on the north side of the downtown development's breezeway between First and Second streets. The shop opened just a few weeks ago, but as Lund and Atkinson will tell you, business is booming. "It's been surprisingly good. We knew business would be better, but with how much volume we're seeing, we really need to be on top of our stuff," Atkinson said. "We brought quite a following with us. When we sent out our notification that we were moving to our email list, that was 1,900 people. Couple that with a bunch of new businesses and that's really exciting." The two partners cite two main reasons for wanting to move. The first is a belief that at some point, the Country Square shopping center located between A and B avenues on Second Street will be redeveloped, whether that's next year or a decade from now. The second reason is that if they didn't move into The Windward, they say, some other barber would. Weighing their options, the pair knew it was the best decision for the continued expansion of their company, which is also growing to include a line of hair care products under the business's new moniker. nights getting things prepared to open. Even today, Atkinson says that their full vision for the space hasn't been realized. But sitting in the shop while getting your hair cut, you probably wouldn't notice. The new space is sleek, modern and inviting. It's a mix of industrial and minimalist design styles that mesh well with its surroundings and the business's aesthetic. Even the lustrous new name — a tip of the hat to Atkinson's great-great-grandfather, a Montana homesteader and Civil War soldier — adds to the business's sweet new branding. 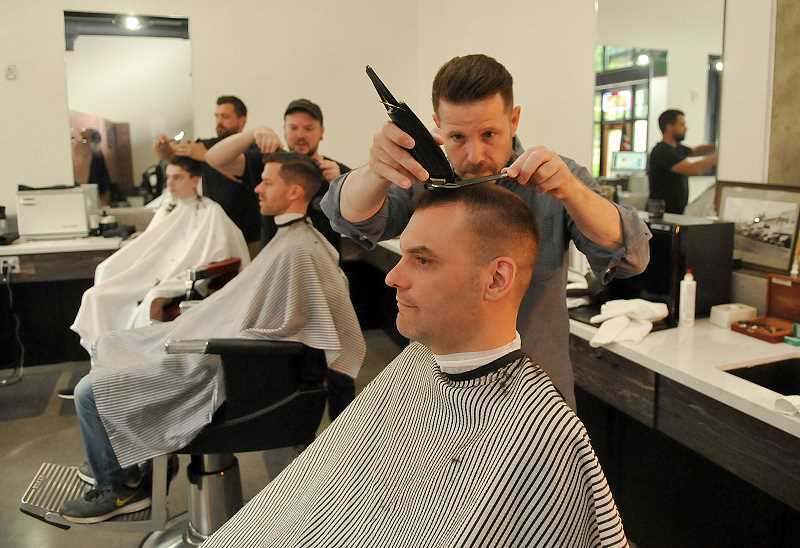 Including Lund and Atkinson (who between them have more than 20 years of haircutting experience), there are five barbers at Richard Henry, although the shop is in the process of adding more staff. Atkinson and Lund have also increased their hours — the shop is now open from 6 a.m.-6 p.m., seven days a week — and expanded their space, from around 600 square feet to 840 square feet. Services include haircuts ($35 for adults, $25 for children under 12), beard trims ($20), straight-razor shaves ($45-$60) and more. As a native Lake Oswegan, Atkinson says he had some pretty strong opinions about the redevelopment of the old Wizer Block. But as he contemplated the significance of the changes taking place in downtown Lake Oswego, he started to see the progress being made to improve the city's livability and offer residents more places to live, dine and shop close to home. "It's 2018. The world is changing, and if it's going to change — while that old building had fond memories — it was ready to go," Atkinson said. "To have something like this in its place is unbelievable." Atkinson and Lund hope to see lots of new and old faces walking through their door soon, and they're both looking forward to seeing how things continue to progress as more businesses open and residents fill The Windward's 200 apartments. For more information about Richard Henry Barbershop, visit http://rhbarbers.com or call the shop at 503-675-7788.